There was a time in my life when the thought of eating duck was not at the top of my list. But today, I'll take the fat and all of it. This recipe reminds me of parties. I love to throw them and I do often. I've made these duck fat fries a number of times for get togethers, tweeking the recipe along the way. I've learned it's also a great side for burgers or a nice juicy steak. We had it the other night with coffee rubbed filets, and I plan to share that recipe with you all very soon! I think I finally nailed the perfect duck fat fry, and this is the recipe I want to share with you! Roughly peel the potatoes. You will want to leave some skin on. 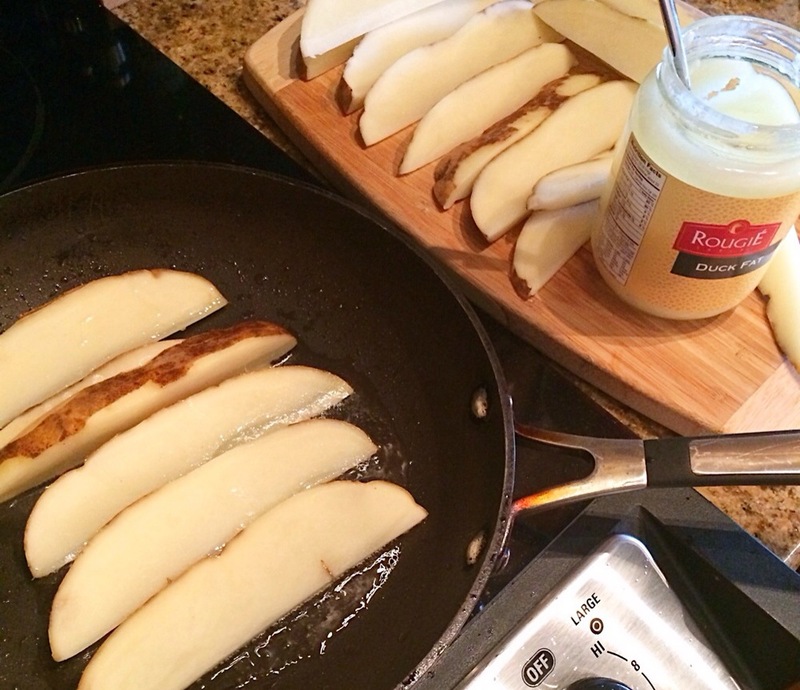 Cut potatoes in thick logs. You should get about 16 from each potato. Soak logs in water for about 1 hour. This will get extra starch out and make them crispy. Drain potatoes and pat dry with paper towels. Heat 2 tbsp of duck fat in a sautée pan over medium high heat (keep the duck fat close by, halfway through you may have to add another tablespoon or two). In batches, sautée potato logs for about 1-2 minute on each side in the duck fat. Place sautéed logs onto a baking sheet lined with foil. Sprinkle lightly with truffle salt and pepper. Roast potatoes at 400 degrees for 20-25 minutes. The last 5 minutes, change the stove setting to broil. This will get them nice and brown and extra crispy. 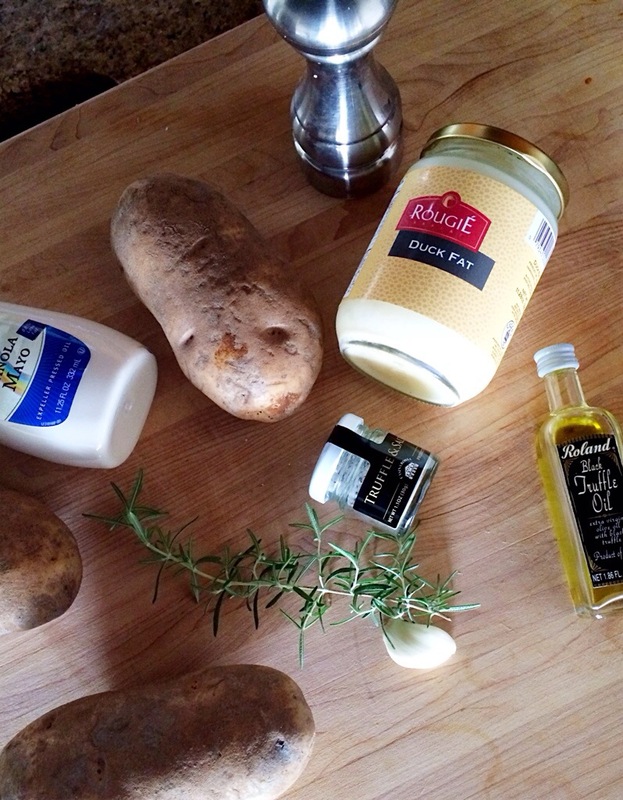 While the potatoes are roasting, make the truffle mayo. Heat truffle oil over low heat. 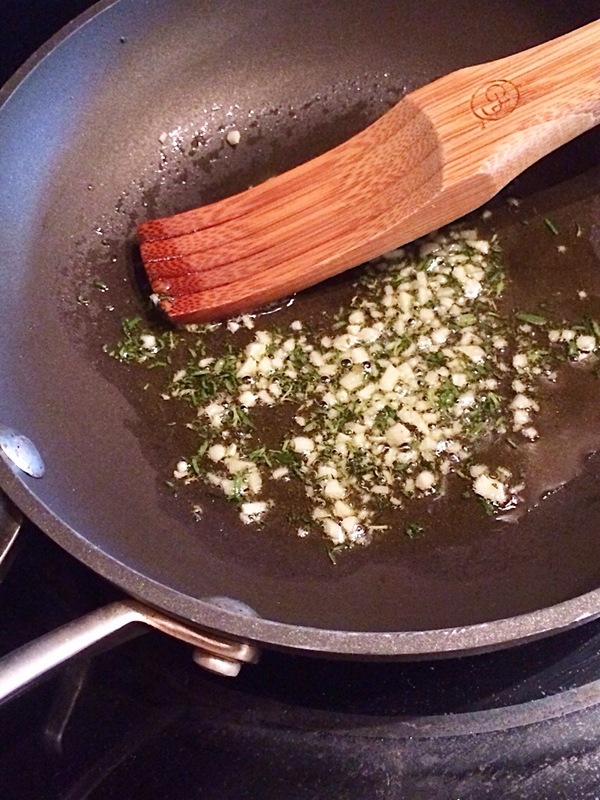 Add minced garlic and minced rosemary. Heat for 2 minutes and set aside to cool. 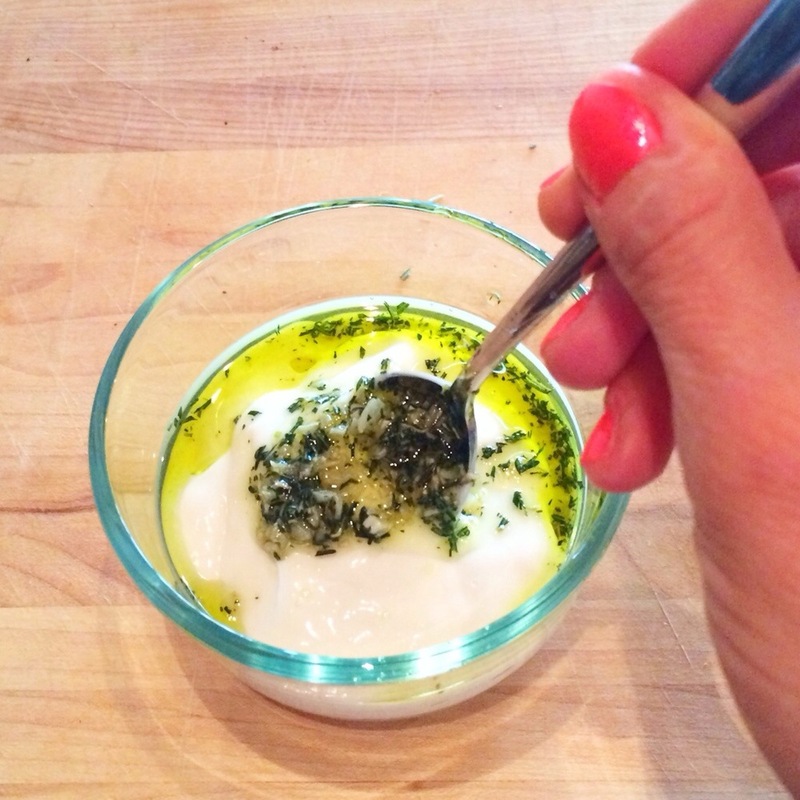 When cooled, add olive oil mixture along with honey and 1/4 tsp of truffle salt (to taste) to the mayo. Mix together and taste. Add more salt if needed. 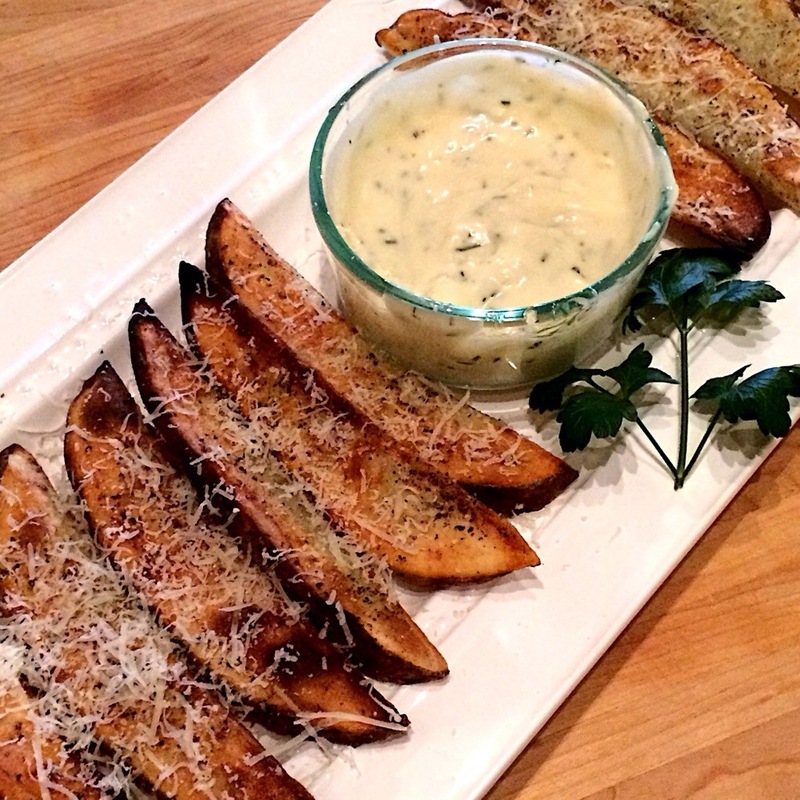 When potatoes come out of the oven, immediately sprinkle them with truffle salt and freshly grated Parmesan cheese. Serve with mayo along side.